Absolute beach front holiday home on a quiet white sand beach - a hidden gem just 5 minutes on from Cooks Beach. The house enjoys panoramic views of Mercury Bay, all day sunshine, and easy beach access descending from the front lawn. The house is a comfortable family lockwood. The holiday home is conveniently placed to local cafes. 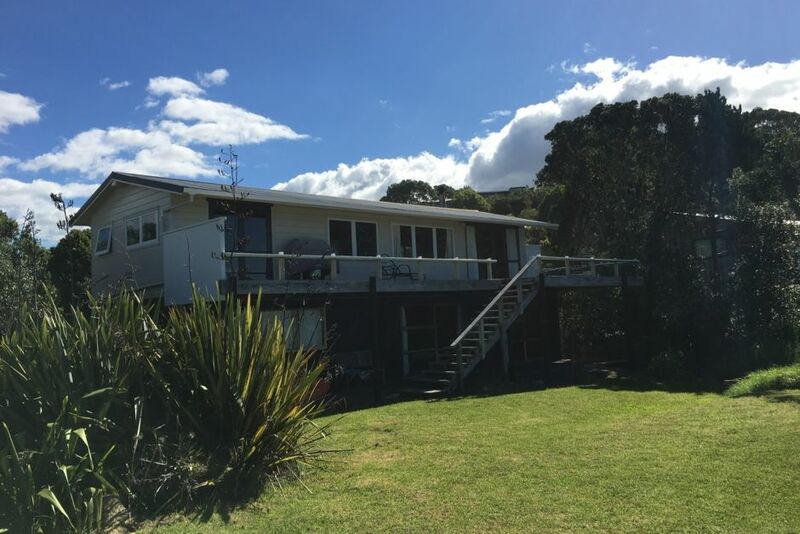 Easy 5 minute walk to Ferry Landing with passenger ferry access to Whitianga Township (cinema, supermarket, shops etc). 5 minute drive to Cooks Beach (general store, bottle shop, restaurant). Excellent walking tracks up Shakespeare Cliff, Back Bay and more. Wonderful place that we visit each year now. A real batch with everything you need. Great location, fantastic view, ticked all the boxes for a fantastic family get away. Real kiwi style old school bach, very homely and inviting. Amazing place! I love that’s it’s atrue batch. Amazing place! I love that’s it’s atrue batch. We will keep returning ???? Fantastic location right on the beach and easy access to local cafe & ferry landing. Fantastic location right on the beach and easy access to local cafe & ferry landing. Spacious with ample seating inside & outside. Only issue was the deck and stairs aren't great for young children (I had to keep an eagle eye on my 3 yr old) We had a wonderful weekend thanks very much. Great location and perfect family NZ Bach right on the beach - will be back for sure!